WWE has extended its stay in Cape Town by adding an additional show at the Grand Arena, GrandWest, on Thursday, 19 April 2018. 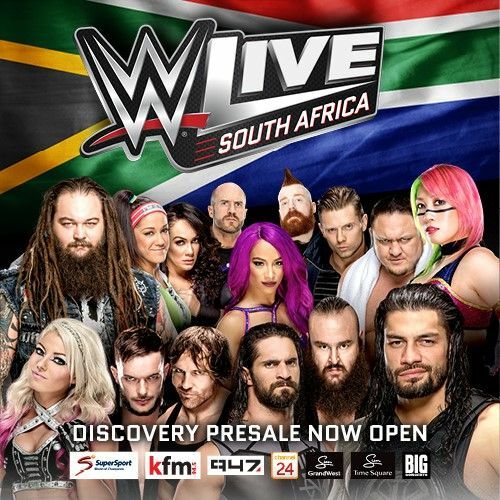 Fans attending WWE Live South Africa will be able to see their favourite WWE Superstars including Roman Reigns, Finn Balor, Seth Rollins, Alexa Bliss, Sasha Banks, The Miz, Braun Strowman, the first-ever Women’s Royal Rumble champion Asuka, and many more. The WWE Live South Africa tour begins at the Grand Arena, GrandWest, Cape Town on Wednesday, 18 April, followed by the new second show on Thursday, 19 April before debuting at the Sun Arena, Time Square in Pretoria on Friday, 20 April. The tour concludes at the Ticketpro Dome in Johannesburg on Saturday, 21 April. The WWE Live South Africa Tour will make stops at the GrandWest Grand Arena in Cape Town on 18 April 2018, the Sun Arena, Time Square in Pretoria on 20 April 2018 and conclude at the Ticketpro Dome in Johannesburg on 21 April 2018. Tickets are available for all four shows now from www.bigconcerts.co.za and www.computicket.com.